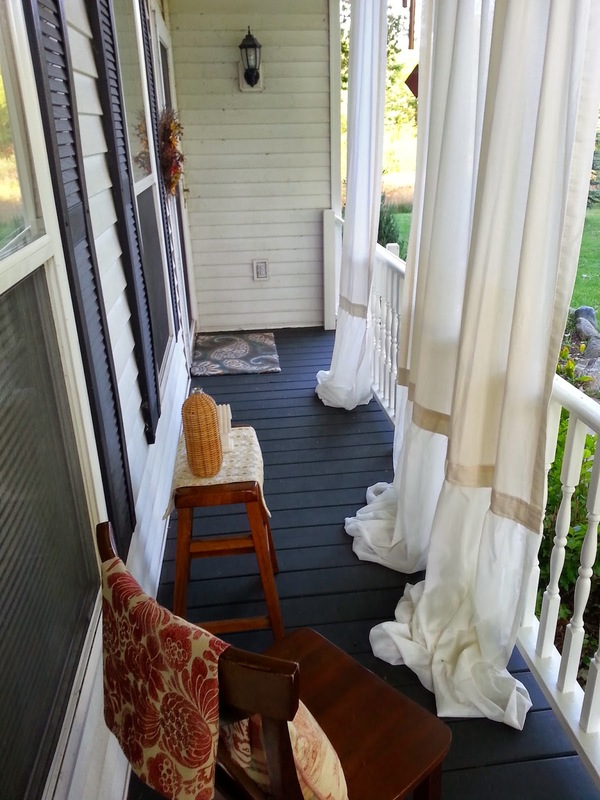 My Front Porch Makeover for Under $100.....with Curtains! Since we rarely use our front door, updating it was not high on my list of priorities. I would think of it only when had new visitors knock on our front door, and regretfully wish it looked nicer. 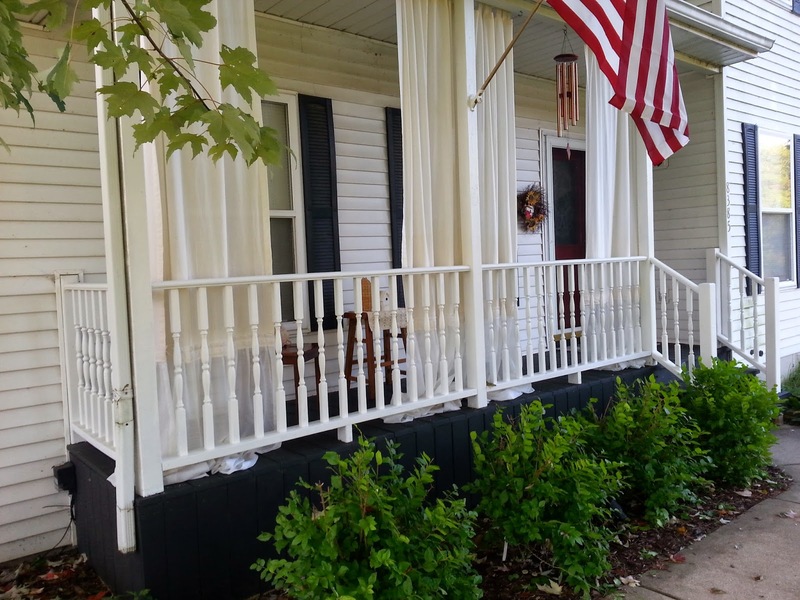 I finally forced myself to focus on updating the porch, and little by little, I was able to make it over for less than $100. The porch looked more like a deck to me, and you could see all the way underneath it from the road. We bought some deck boards, cut them, and screwed them in around our porch to give it a more homey look. The least fun part of this whole project was prepping the porch for new paint and stain. I recruited our two oldest daughters to help me scrape as much of the old paint off of the porch railings and floor. 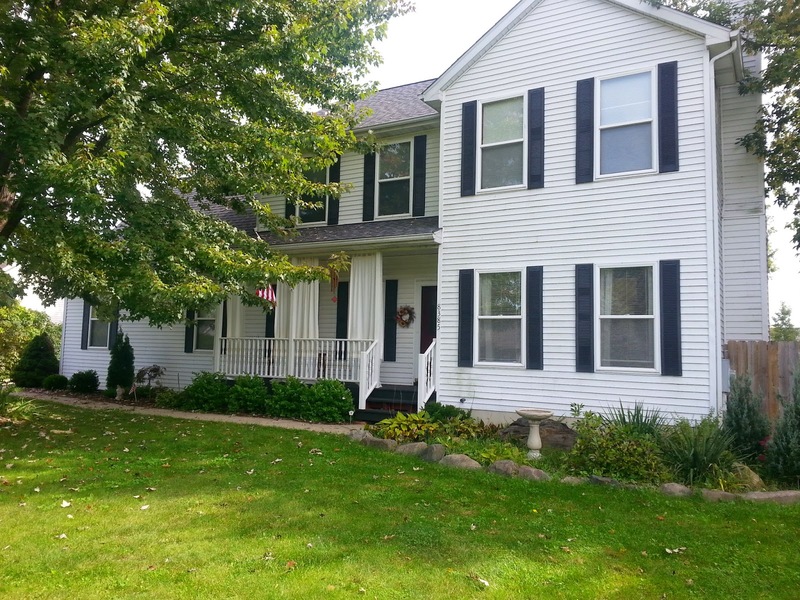 I bought a very dark resurfacing stain called Behr DeckOver for the porch skirt and floor, and a white exterior paint for the railings. I also painted our front door in a red oil-based paint. Let me tell you, that was a MESS. But it turned out better than I expected. This picture doesn't do the color or sheen justice. I'd do it again if I had to, but beware, oil paints are messy! 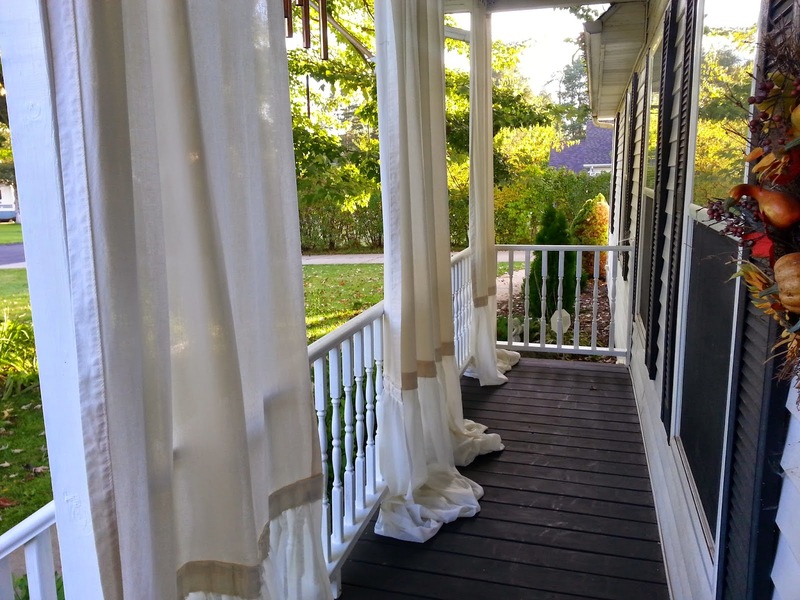 My favorite part of this whole project was adding curtains to our porch. Because I was on a budget for this project, I knew I would have to make my own curtains. I even found an idea on Pinterest how to make my own curtain rods with eye hooks and electrical conduit. I got really lucky and found four white panel curtains at a local resale shop. Then, I found four sheer panels to sew to the bottom of the solid panels to get the length I was looking for. All of the curtains and materials to make the rods cost right around $30. I'm really happy with how the porch turned out, and I'm not ashamed anymore when visitors use our front door! If you'd like, please take a minute to watch my video below to see just how it all came together. wow! What a simple but amazing makeover. I would have never thought to put curtian on the porch but they look great. Thanks for sharing at Simple Lives Thursday; hope to see you again this week. I love porches! The skirt idea is excellent. Thanks for sharing. I'm a farmer and I love to see people blooming where planted. Well done!